Dr. G.N. Qazi took his postgraduate degree and Ph.D. both from M.S. University, Baroda, India. Dr. Qazi after his Post Doctoral Research in Biochemical Engineering at the University of Dortmund where he worked on Bubble Column and airlift bioreactors worked in the area of molecular biology at Max Plank Institute of Biochemistry in Munich (Germany). Dr. Qazi served as Chairman of Biotechnology Division for six years and brought international recognition to the Division by giving it a lead in fermentation technology for a large number of commercially viable products. To name a few, the most important fermentation processes developed by Dr. Qazi and his group are: gluconates, bio-control agents, plant growth promoters, novel enzymes, kinetic resolution of chiral drugs. His work of gene cloning and genetic manipulation is widely acclaimed and recognized internationally. Dr. Qazi has been instrumental in the development of eleven fermentation processes, out of which the processes on resolution of NSAID Naproxen and production of Iso-vitamin C, Gluconates, Glucose oxidase, Citric acid, Plant growth promoters and Bio-control agents have already been passed on to several industries. Dr. Qazi has also established a Regional Centre on Bioinformatics at RRL, Jammu. Dr. Qazi has about 200 research papers published in the national and international journals of repute and presented equal number at different national and international conferences. He has also delivered a number of invited lectures on Fermentation Technology and Genetic Engineering both in Indian and foreign universities and institutes. He has over 60 patents in his name. 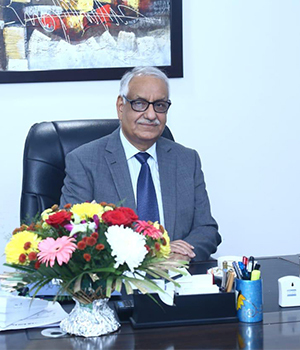 From October 2008 to August 2016, he was Vice Chancellor of Jamia Hamdard (Hamdard University), New Delhi and then join HIMSR as Director General.